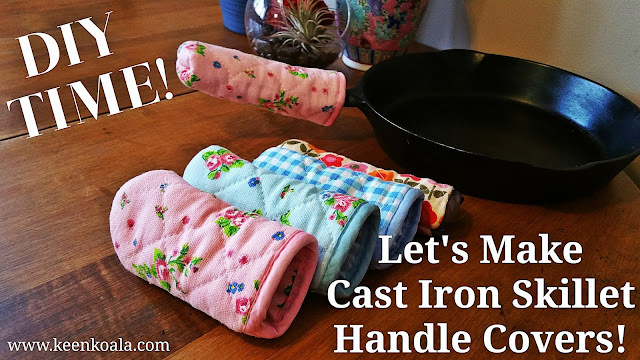 Have you ever went to grab the handle of your cast iron skillet only to scald your hand? This happened to me today. I wasn't expecting it to be so hot as I had turned the burner off. 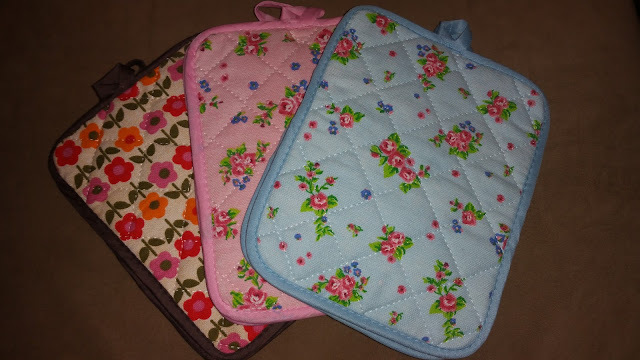 As I leaned over the sink allowing cold water to run over my red and stinging palm, I looked up at the owl-shaped pot holders hanging from my cupboard door, their big eyes mocking me. 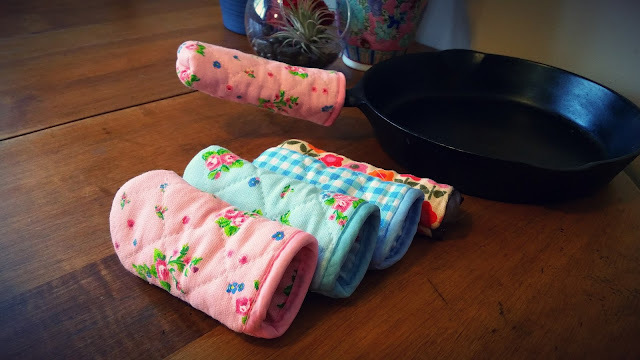 As I stared back at them, a light bulb went off in my head with an idea of how to make some inexpensive but adorable handle covers for my cast iron frying pan. They turned out so cute, that I just had to share a tutorial with you! Cut your pot holder to the approximate length of the handle of your skillet. 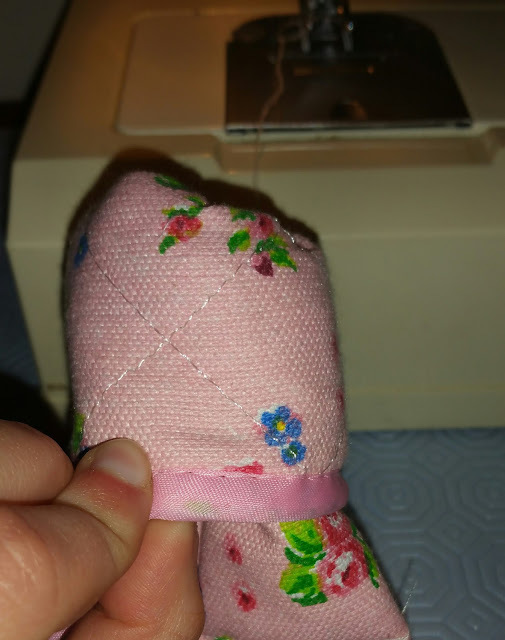 With your sewing machine, zig-zag stitch along the free edge a couple of times to prevent fraying. Look at your pot holder. Decide which side you will want to have as the outside and which you will want to have as the inside. 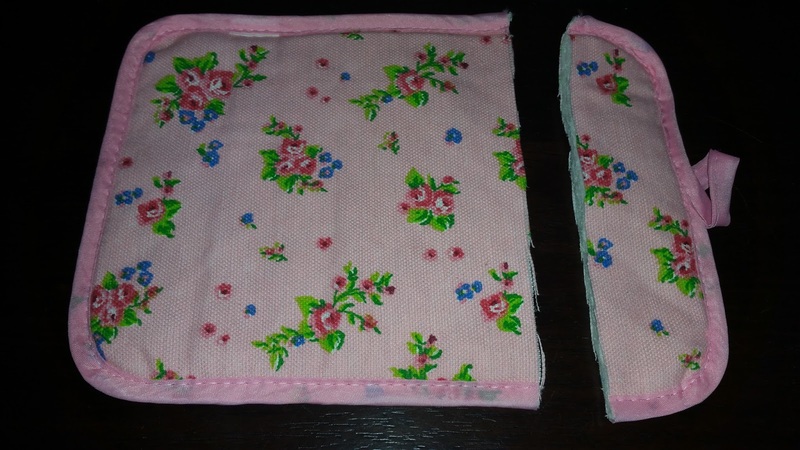 Fold your pot holder in half, so that the surface you want to have on the OUTSIDE on the finished product, is on the INSIDE. 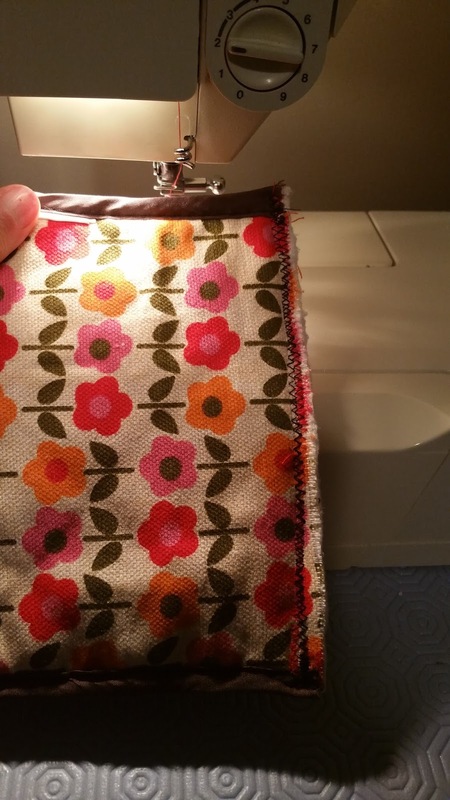 Using a straight stitch, stitch the 2 sides together. Do not stitch along the third side, the narrow hole with the bias tape, as that will be the hole that you put your skillet handle into. I have posted a photo below to better show what I mean by this paragraph. 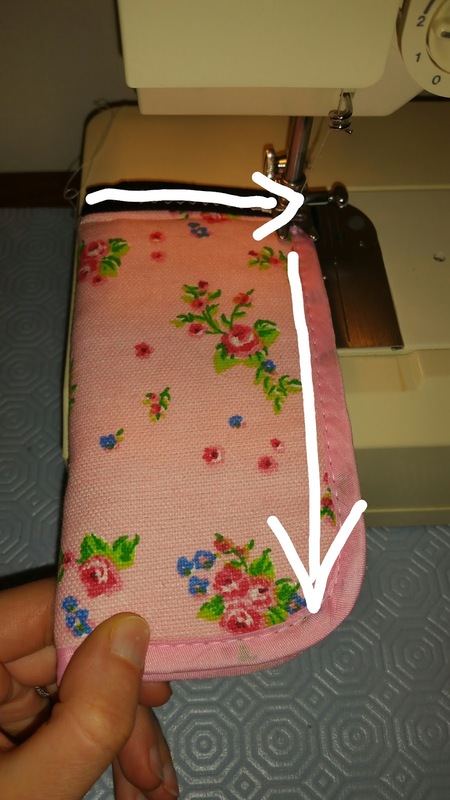 Make sure to sew back and forth a few times at the beginning and end to seal/tie your stitches. Turn your work right side out. This part is a bit difficult as the project is a bit narrow. 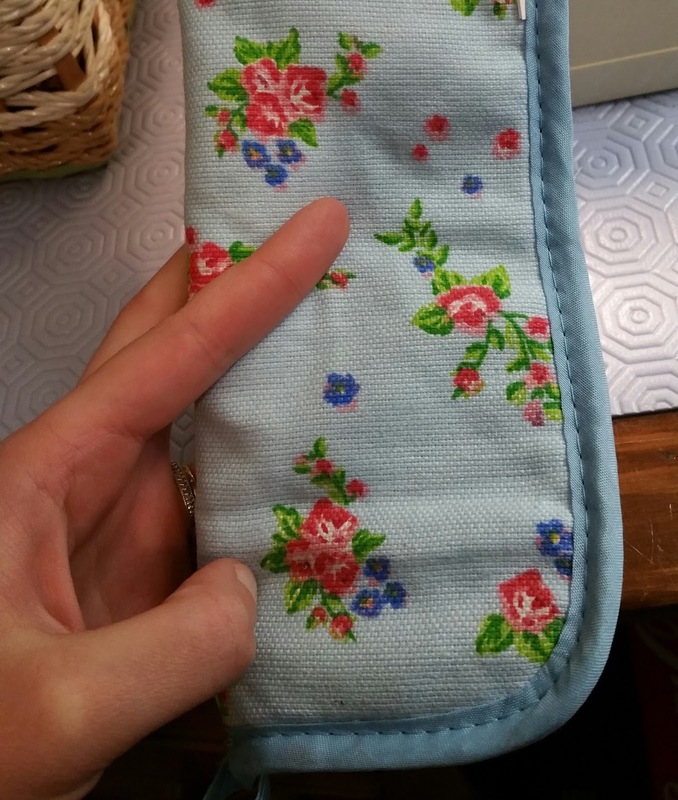 I found using the round end of a fat crochet hook helpful to help push it through, just be careful as to not tear your stitches! There, once you have it turned the right way, that's pretty much it. Your new cast iron skillet handle cozy is ready to use! Just make sure not to leave it on your skillet while cooking unattended as it is made out of fabric, and it may scorch if left too close to the stove burner! If you enjoyed this tutorial, please 'LIKE' Keen Koala on Facebook for instant access to all of the latest posts, exclusive content, and contests by clicking HERE!